Three hundred recovering cancer patients were treated to the experience of a lifetime in China this week: the chance to play in a pit filled with one million balls. 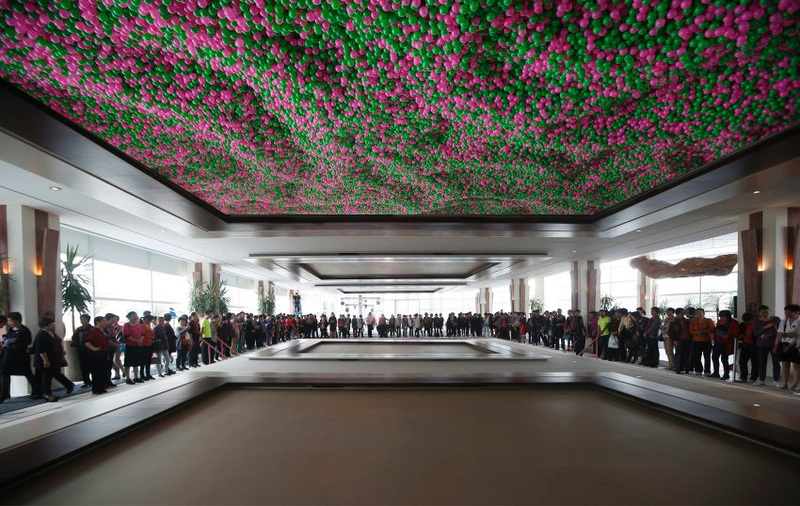 One million pink and green balls were brought into the Kerry Hotel in Pudong, Shanghai Wednesday for a Guinness world record attempt at the world's largest ball pit, according to Reuters. The event was part of a "Pink October" campaign aimed at raising awareness of breast cancer prevention. The balls, some with hand-written wishes on them, filled a 25-metre-long, 12.6-metre-wide (41 ft.) swimming pool in the hotel -- the sight of which made for some spectacular images. The photos above were posted to Reddit yesterday, prompting a slough of wistful comments from people who've experienced the joys of a ball pit or would really like to in the future. A user named tacothecat saw an opportunity among the photos and cross-posted one of them to r/photoshopbattles -- a subreddit dedicated to remixing images. It wasn't long before others started getting creative with the giant ball pit photo. Some users imagined what might be lurking beneath the balls. Others mocked up images of the pit filled with other objects, like the gold coins Scrooge McDuck famously swims in on the cartoon Duck Tales. One user turned the ball pit into a Pitt pit. The highest rated photo to date is simply an inverted room, with the ball pit appearing on the ceiling as opposed to in the pool. "BALL RELEASE IN 10... 9... 8..." reads the caption. When is the last time you can remember playing in a ball pit?